Have you searched for new self-care activity ideas lately? When I first published this article back in 2016, there were about 17,900,000 results on Google. In 2018, there were 23,400,000. Any idea how many there were today? 344,000,000! There are countless ways to practice self-care, and that number will likely continue to grow. 1. 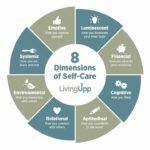 Living Upp still has the longest and most comprehensive self-care activity list available on the web. In 2016, I completed a yearlong self-care challenge, and for 366 days straight (hello, leap year!) I tried out a new activity and then blogged about it. You can read about all 366 of my self-care experiments in my eBook here. 2. Good Therapy has an exceptional list. And #10? What a great way to start the day by helping others! 5. Confident Life gives 20 examples of self-care activities that can be completed in just 10 minutes! 6. MindBodyGreen lists 15 ideas to try when everything seems impossible. I love how self-compassionate #7 feels. 7. Travel Well Magazine offers a few self-care ideas as well. As difficult as #4 can be, sometimes it just needs to be done. 10. Tiny Buddha lists 45 self-care practices for a healthy mind, body, and soul. #7 comes soooo easily for me! I hope these lists give you a few ideas for incorporating more self-care activities into your busy life. Ready to begin designing a healthier lifestyle? Join our FREE community here. This entry was posted in Self-Care Activities and tagged aptitudinal, cognitive, emotive, environmental, financial, luminescent, relational, systemic. Thank you for including my list!